Apparently, what's happening in Vegas isn't the only thing staying there. According to statistics, the City of North Las Vegas is one of the fastest growing areas in the country, with an estimated 1,300 new residents settling in every month. While growth certainly affords benefits, it also carries with it an unfortunate byproduct: elevated crime rates. In an area that already dons the nickname, “ Sin City ,” law enforcement personnel are indeed facing heightened challenges. Thanks in part to a bolstered Neighborhood Watch program, however, residents are taking charge of their neighborhoods and providing police with much-needed assistance. It was nearly 15 years ago, in 1993, that North Las Vegas christened its first Neighborhood Watch. At the time, the program consisted of just a few groups of neighbors and one sergeant, who focused on helping residents contend with neighborhood-related issues. It appears Dennis' approach has worked. Between 5,000 and 8,000 residents are estimated to be participating in Neighborhood Watch thanks to a surge in growth over the past two years. In addition, the number of block captains has also skyrocketed, growing from an average of 25 in 2005 to 360 in 2006. And it appears the trend will continue. In just the first month of 2007, 15 applications for block captains have already been submitted. To further strengthen communication, coordinators formed an Alliance of Homeowners Associations, which invites presidents from each of the homeowners associations to participate. “Through this alliance, each of the communities is given a voice to express the issues that are important to them,” says Dennis, who says the primary purpose of the alliance was to build a sense of community and provide residents with an avenue for addressing community issues unrelated to crime. Dennis provides surveys to block captains and invites speakers based on the feedback she receives. Dennis also feels it is important to stay in regular contact with residents, so she sends regular emails to Neighborhood Watch participants containing crime trends, information on wanted suspects, and other pertinent information. 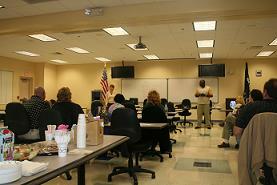 Residents are also encouraged to attend Citizens Academy, which, according to Dennis, has greatly improved communication between police and the community by offering residents insight into how the police department works, how to call and obtain the best response, and what issues should prompt a call. 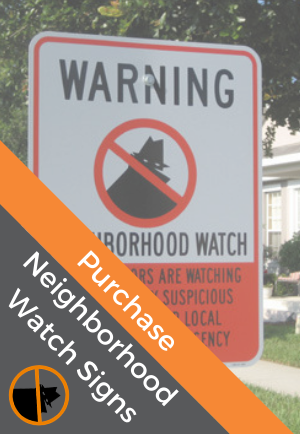 In the works are two additional programs: Apartment Watch and Business Watch, which are based on the same concept as Neighborhood Watch. 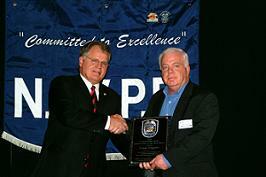 Chief Mark Paresi presents an award to a North Las Vegas Block Captain at a recent Awards Dinner. Perhaps the most notable success of the North Las Vegas Neighborhood Watch program is that it has sparked a greater enthusiasm among residents and empowered them to get involved with and take charge of their communities. An incident that took place a few years ago is a perfect example. One evening, police were pursuing a burglar who was jumping fences and running through yards. When residents saw the burglar, they began turning on their lights, and when the suspect jumped over a wall and into another community, they immediately alerted their counterparts about the situation. Their diligence not only helped keep neighbors informed, but also aided law enforcement, who were eventually able to apprehend the suspect. Dennis attributes much of the success of the program in recent years to Police Chief Mark Paresi, who hails from an agency in which crime prevention was a top priority. “He is a proponent of community policing and has a huge knowledge base, so when he came on board, crime prevention was one of his main areas of focus, and it still is,” says Dennis. In fact, according to the North Las Vegas Police Department's website (www.cityofnorthlasvegas.com/Departments/Police/Police.cfm), “community policing concepts are the ... cornerstone of the department's philosophy.” “Chief Paresi has been able to offer a lot of direction in terms of improving communication with citizens, setting things in place, and providing effective education. 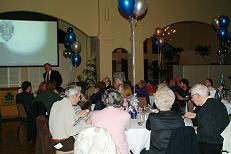 And equally important, he has been very supportive and demonstrated this support by attending meetings to motivate and thank volunteers for their efforts.“Dennis admits that there definitely have been times of struggle for the City's Neighborhood Watch program, but the key became empowering and educating residents on ways in which they could help and what they could do oprotect their neighborhoods. “It's really not about the police department or about neighborhoods independently,” says Dennis. “It's about creating partnerships. When you empower people to work together, you can do amazing things."